Well okay. So a number of you probably figured this was coming. This is my tribute to the king of all-in-one analog recorder/reproducer multitrack tape devices. I've had it for several weeks now and of course already have torn it apart cleaning it up and doing various minor repairs...doing my thing...but this is a keeper for sure. As I've "dug" into it I am so impressed with how it was engineered and the features it holds...I'll get more into that as I present the story in installments. I cannot imagine this thing being anything but a blast to use. I've had my eye peripherally on the 388 ever since I first saw one. I remember my first reaction after seeing a picture of one shortly after returning to analog a couple years ago. Seems funny but up until that point I had totally missed the 388. They were introduced and discontinued before I got serious into recording and I quickly (regretfully) switched to digital after owning a Teac 3340S for only a short time. I was focused on the digital world for over a decade. So anyway, I remember thinking "What is that??" when I first saw a 388 and when I confirmed for myself that it was what I thought it was (functionally) I thought, and still think, it is the est piece of analog kit. So one did come up locally recently. No accessories, no manual, some empty 1/4" x 10.5" and 7" plastic reels and some unknown tape in poor condition, but it was local. When I went to look at it the seller nicely took the time to help me check out all the functions...had a mic and some monitors and headphones handy and some pre-recorded material as well. What I found was 388 in sound but not perfect condition...not abused, just used and in "it'll clean up good" condition. A couple mismatched and/or damaged knob caps for which I have spares, master meter lamps burned out, lock tab for the channel 2 mic jack broken and various scratches and nicks. Everything else was fully functional. Like I said, I could tell it had been used but appeared to have been reasonably well respected...not as nice as cjacek's 388 by any means. Anyway, $350 and it was mine. Not a steal of a deal and I knew it, but not as high as I see prices climbing for these on eBay either. And, it was local...no shipping nightmare. Yes, I agree, the shot of the headstack was worthless but the seller tried to get a hold of a camera other than his phone...he gave it a go. Last edited by sweetbeats; 10-17-2018 at 12:01. You, Cory, Dave (A Reel Person) and myself are probably responsible, at least in part, for higher and higher 388 ending prices, of pimping the thing over the years, all for good reason, of course.. .... but your effort, I have a hunch, may take the cake! PEOPLE, GET YER 388 DEALS BEFORE IT'S TOO LATE!!! BTW, it seems only fitting that my 6000th post just happens to occur at this great time when Cory finally owns a 388! Ohh, Cory, now you've done it! 6000! That's AWESOME...and in MY THREAD!! I'm stoked! Serious about the prices on 388's...I started noticing when that significantly "upgraded" one went for...well over $1000 right? But then there was another one that just went for near $600 and there's another right now that is going to go for at least that much...well, it deserves it. The 388 is awesome. I think people overlook what Teac built into it, and how smart they were with the design. 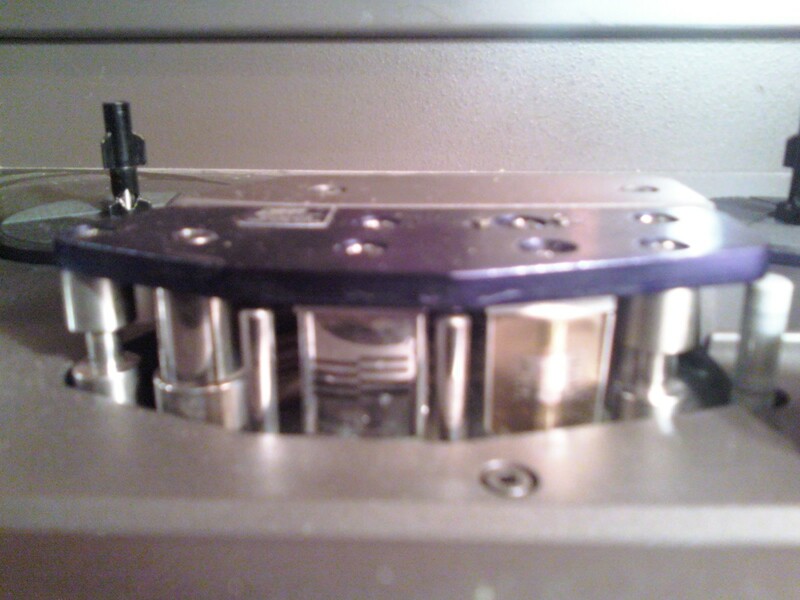 It is very well laid out and lacks nothing AFAIC...No plastic pulleys like on other 1/4" 8-tracks. The transport handles tape so smartly, and when you look closely at the transport, though it is petite (compared to 1/2" or greater tape) it is very sophisticated and refined. Precision fixed erase head and semi fixed record/repro head...fixed guides and everything else (except the lifters) in the tape path is a roller. I was working on my Ampex 440-8 1" 8-track tonight and popped into the room where the 388 presently sits and the transport is SO much smaller but definitely heavy-duty for what it is. It was built for professional use. So like I said I've had this thing for a few weeks but I've taken a ton of pictures along the way so I'll be getting posts up in installments relative to the time period in which pictures were taken. The first post had the pics from the eBay listing, so below are pictures I took when I got it home and unpacked. Again, pretty good shape...scratches on the tap panel. 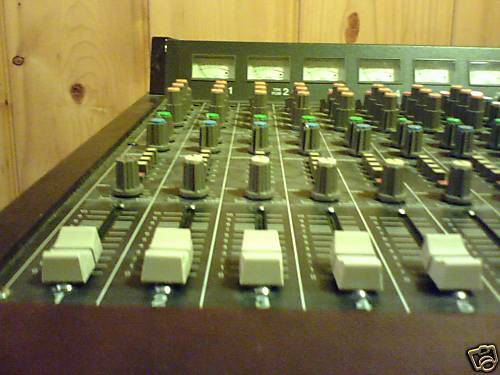 I'm taking that to the same auto-body shop that painted the meter bridge on my prototype Tascam mixer...I'll have them paint the 388 top panel and I'll get some touch-up paint to take care of some of the other scratches. All the lights work except the stereo meters...not a big deal. They are the fuse-type bulbs but I'm going to go ahead and get some of the 8V lamps from Parts Express and solder them in. And I have to admit I was pleasantly surprised at the tape pack after a fast-wind spool...plastic reels, standard hubs...it looks pretty good! So now to zoom in a bit on the transport and tape path...like I said, its petite (compared to what I'm used to...this is my first 7" deck...), but it means business! And funny thing, it wasn't until I snapped this picture that I actually read the sticker on the head plate...Relapped by JRF! So...okay...it must have some hours on it but the heads look good, and I'm sure the relap was done well. Capstan shaft is glossy...don't know if that will be problematic or not...so bought a new one to have on-hand...Teac had 'em in stock. Also got a new capstan belt though the one on the unit seems healthy. Going to get a spare pinch roller too though, again, the present one seems good...not soft or tacky, not hard or checked. Just needs cleaning. I may get a set of guides too though I'm not sure if that's important since they can be rotated. So, that's all for this installment...more to come of course. Sweetbeats! I have two which I paid $350 and $450 for locally. I have already mention in another thread all the extra goodies I got with the second one. Davemania and East River Pipe (read an interview with him in very early tape op issue) are responsible for my interest in the 388. But for anybody else thinking about getting one, don't; you won't like it! And when I bought my first one about 3 years ago, RMG LPR 35 was only around 12.50 a reel from US Recording Media. So not only have prices on the 388 gone up, tape cost has too!! I know these 388's are a cult item, but why do you all think that is? I have to think the all in one design is the main reason. it that robust. especially for how heavy they are. and if you look at the specs, they kind of lack much high frequency reproduction. Is it the mid-fi sound that is kind of nostalgic, perhaps? whatever it is...i'm against it. In any case, the link in my signature is to an 8 page thread on Tascam 388 maintenance, trivia and general information pertaining to this wonderful recorder/mixer combo, with many quotes from members of this very board, the Tascam forum and TapeOp. It may help to illuminate why many are enamored of it despite its shortcomings. Thanks to all who have provided their knowledge, experience, materials and insights. Well, regular posts, photos, discussions and overall drooling over the 388 sure does help sway opinion. Outside of that, yes, I'd say it's indeed the all-in-one design, the most "artsy", functional and unique piece of 'em all. There is just simply nothing like it but more than that, it solves numerous problems and does it so elegantly. First off, compared to what? What exactly are you talking about? Don't look at paper specs. They have their place but they're mostly meaningless. Have you heard a 388 in person and I mean one in good condition with good tape, using good mics? That's very subjective but I can make my 388 sound as lo-fi or hi-fi as human hearing will allow. Believe me, the machine can put out incredible recordings, if all the other variables come together. Does the 388 sound like a 15ips, 1/2" machine? No but that's not within its design. 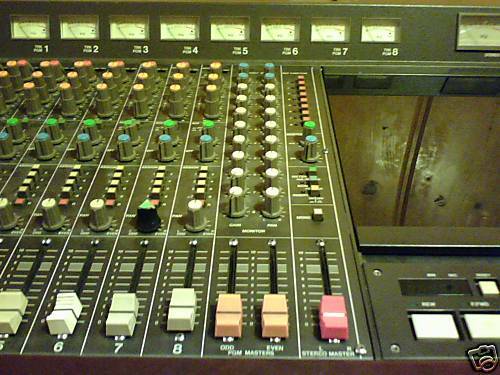 The 388 does one thing extremely well: It gives you an entire foundation to start recording immediately, tracking and mixing, a superb mixer attached to an open reel 8 track. Tape is cheap, plenty of tracks and puts out fidelity that is more than enough for most.